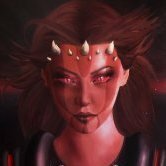 **A communication from Axkva Min** My sisters, we have been hearing reports for some time that Elvira has been working for the Emperor. We believe we have confirmation of her treachery. Elvira has turned against us. She has stolen the treasure we were to use to buy new weapons. Reports tell us that she has hidden the treasure in her basement dungeon on Tatooine. We must recover what's ours before the Emperor does. Find our property. Find Elvira and execute her! The Dungeon has been located. This event is now closed to further comments.